The first step for landowners is to determine if an HWA infestation is present on your property. This involves scouting for HWA, making sure to look carefully at several twigs on all sides of a tree and surveying trees throughout each stand. For help identifying hemlock trees or HWA, you can use our Hemlock and HWA Identification Guide. Management strategies are only necessary if you have HWA on your property. 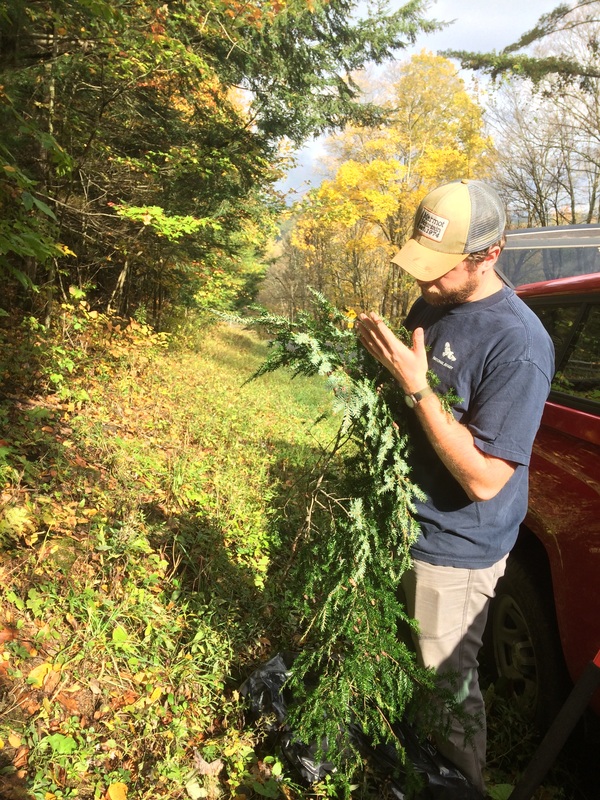 If you do not detect HWA, there is no need to treat your trees, but do continue to check on your hemlocks a few times a year to catch new infestations early. Early infestations are easier and less expensive to manage than well-established infestations. 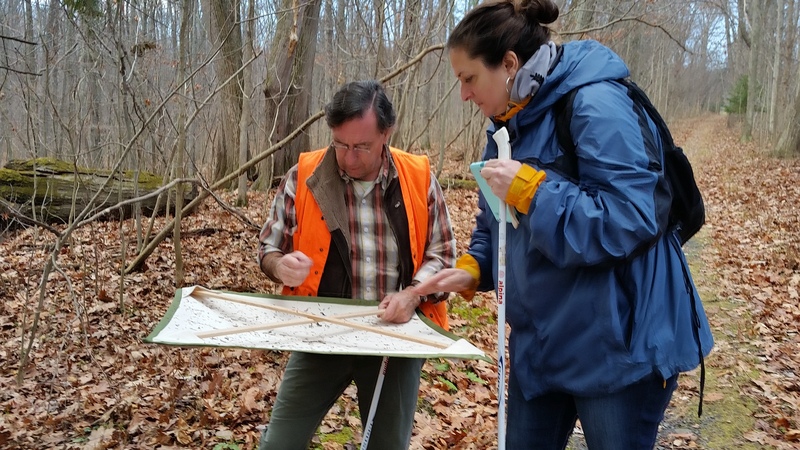 Management using biocontrol: Please note that all of our biocontrol release sites are located on publically-owned lands (DEC lands, State Parks, National Forests, etc.) and that our biocontrol bugs are not available for use on private lands at this time. If you have found HWA on your property, don’t panic! There are several options for management and treatment. Since it takes HWA several years to kill a tree, you have time to prepare and prioritize your management goals. In many cases trees with thinned canopies are able to be brought back to full health. While we recommend consulting with a licensed arborist and pesticide applicator, there is an effective product that landowners may purchase for treating trees themselves. Selecting the right treatment plan can impact treatment efficacy and cost, so it is important to consider several options to find out what will work best for you and your trees. Visit our Treatment Options page for a list of available treatments for HWA. There are two systemic pesticides that are used to treat HWA in New York: Imidacloprid (active ingredient) and Dinotefuran (active ingredient, brand names Safari™ 20SG and TransTect™). Imidacloprid is a great tool for treating trees since it is effective for up to seven years following application and is relatively inexpensive. However, it is relatively slow-acting and can take up to a year to become fully effective in the canopy. While it is active in the tree, the tree’s HWA infestation will die, and HWA will be prevented from re-colonizing the treated tree, as individuals will die as they begin to feed. The only treatment option available for use without a Certified Pesticide Applicator certification is soil drench of the imidacloprid, which can be purchased at your local garden supply store or online. You can visit our Imidacloprid Information page for more information on Imidacloprid, including its fate in the environment. Dinotefuran is another tool for ridding a tree of an HWA infestation. It is fast-acting in the tree, quickly reaching the canopy (within two to three weeks), but it is only effective in the tree for about a year following application. 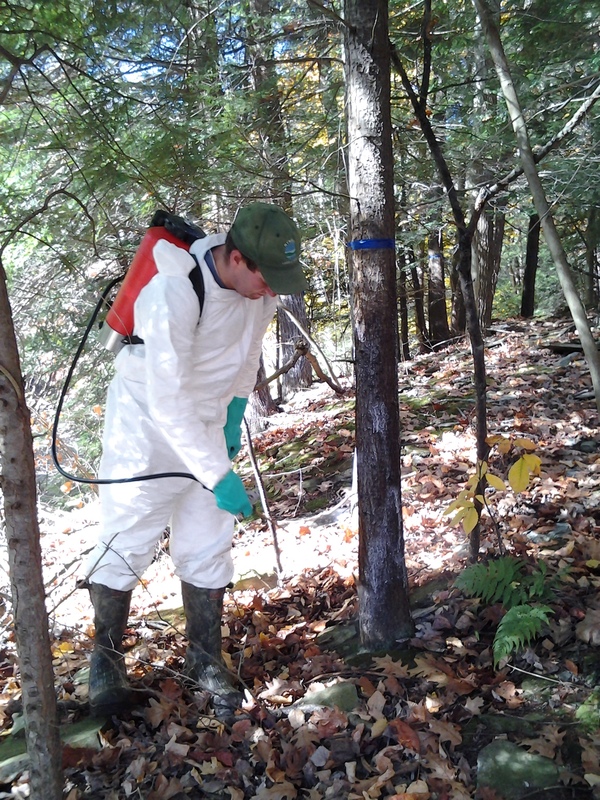 Application with Dinotefuran is most useful for older trees or trees with severe crown decline that may not survive another season of HWA infestation. Use of Dinotefuran is only allowed with a pesticide applicator certification and only as a basal bark application.